Once again, SUSEcon was a blast! Thanks to everyone who helped make it such a great success, especially all our customers and partners who attended. Erin explained on stage at a high-level what this appliance does, but below are some more specific technical details which may help in case you haven’t yet tried it out. The appliance can be booted on any physical or virtual 64-bit x86 machine … but before we start! – if you would like try running the appliance in a VM using either KVM or VirtualBox, then there is an even easier alternative which uses Vagrant to reduce the whole setup to a one-line command. If you like the sound of that, stop reading and go here instead. 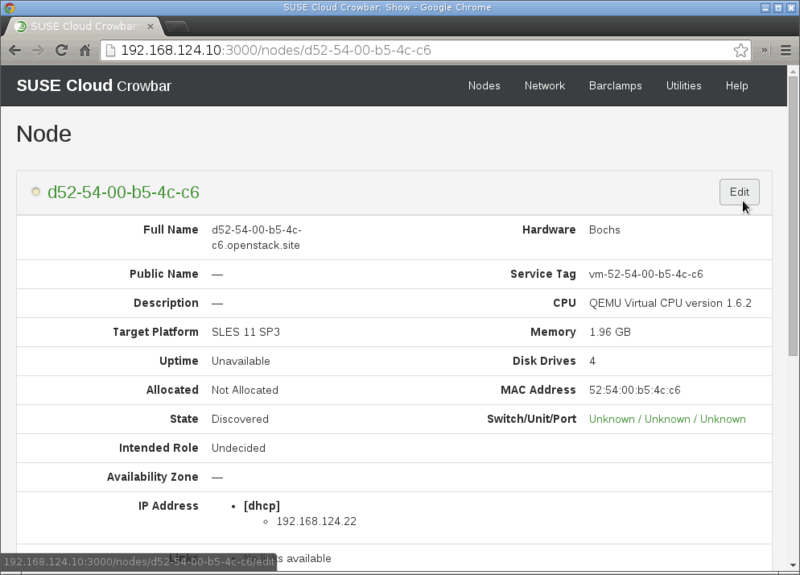 However if you want to try it on bare metal or with a different hypervisor such as VMware or HyperV, read on! 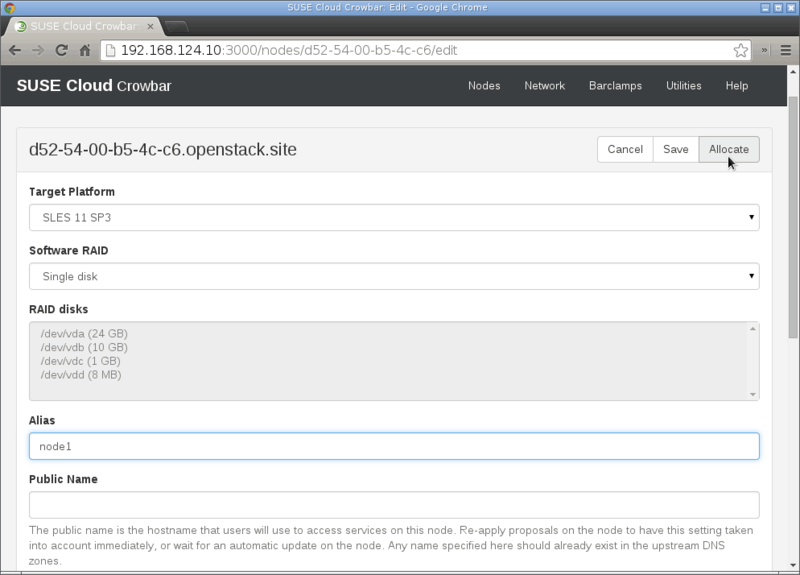 if you are installing on bare metal, ensure there is no DHCP server active on that L2 segment. 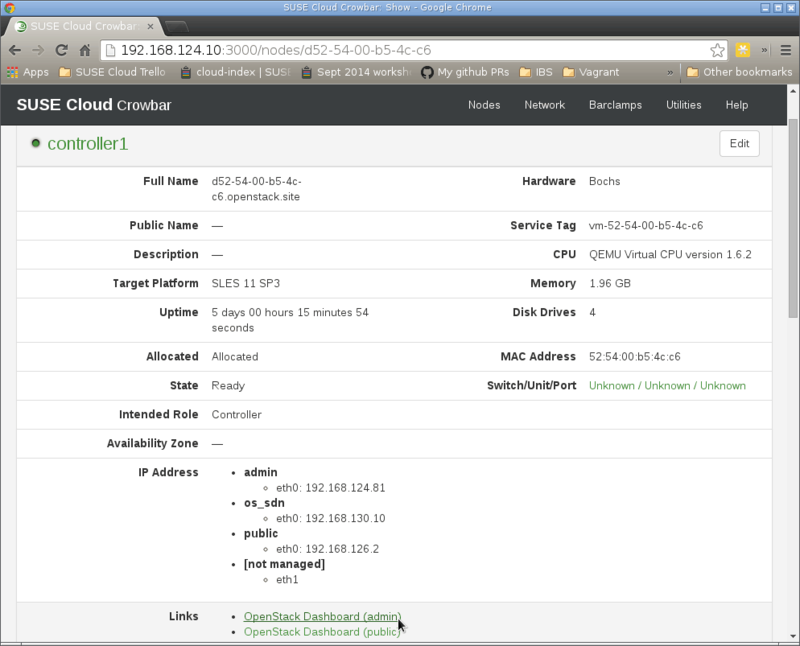 Another machine (physical or virtual) with a modern web browser on the same private IPv4 network. Attach the bootable USB media (physical or virtual), and boot the machine. 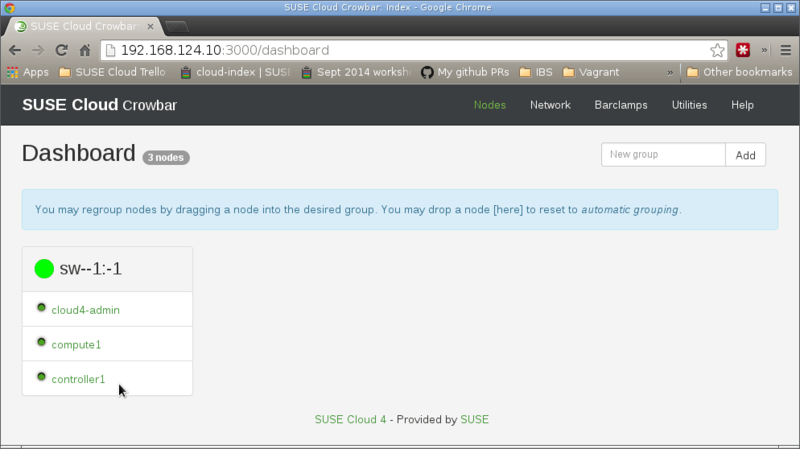 This will automatically install a SUSE Cloud Admin Node onto the disk. Caution: this will wipe any pre-existing OS, so only use it on a spare machine or freshly-created VM, with no valuable data on any of the attached disks! the NTP configuration (supplying an upstream NTP server is recommended but not required). 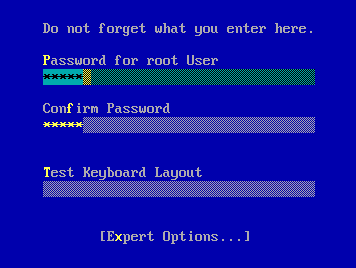 Log in as root (with the password you specified above) either on the console or via ssh root@192.168.124.10 if you have another machine configured to be on the same subnet. Press q and then y to accept the beta EULA, which highlights that the appliance is partially based on unreleased code. Please do not use it for production deployments! 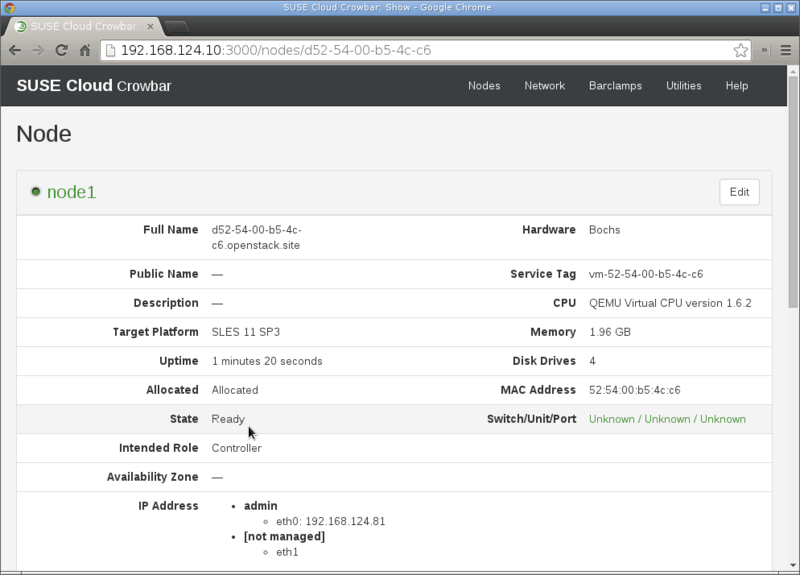 From here you can examine and change the networks Crowbar will use. Some are only used when various options are selected later on, but at a minimum, admin, nova_fixed, and nova_floating will all be used. 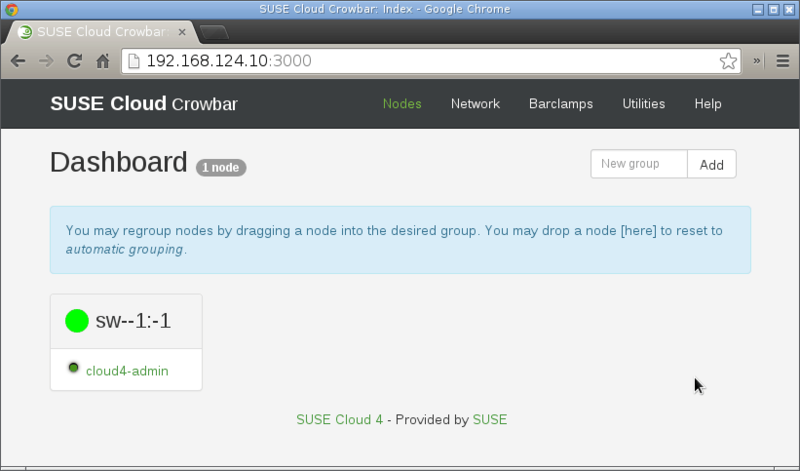 For more information, see the Networking section of the SUSE Cloud Deployment Guide. 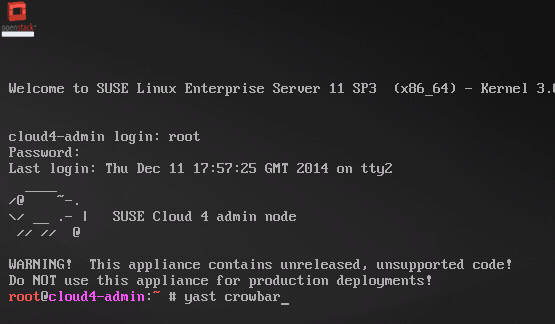 From the shell prompt, type screen go to initiate the installation of SUSE Cloud. This will take several minutes. 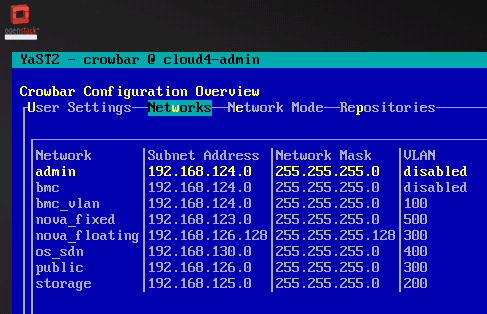 On another machine on the same network as the machine running the now-installed appliance, start a browser, and navigate to http://192.168.124.10:3000/ (adjust the IP accordingly if you changed the admin network above). 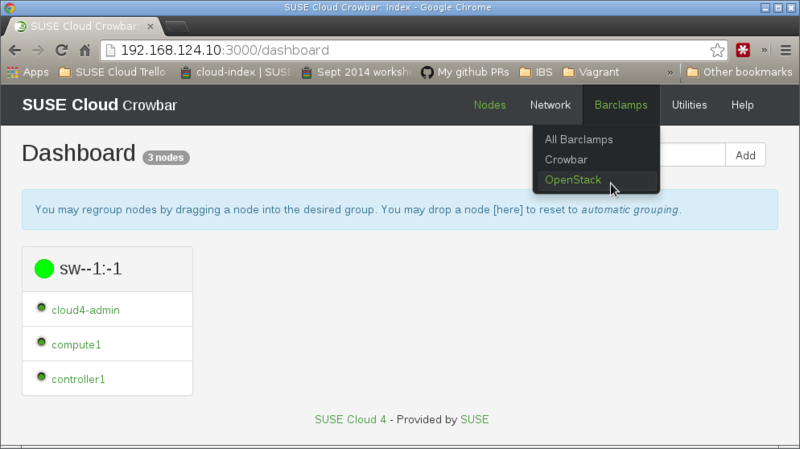 Multiple nodes can be installed via PXE/AutoYaST at the same time. 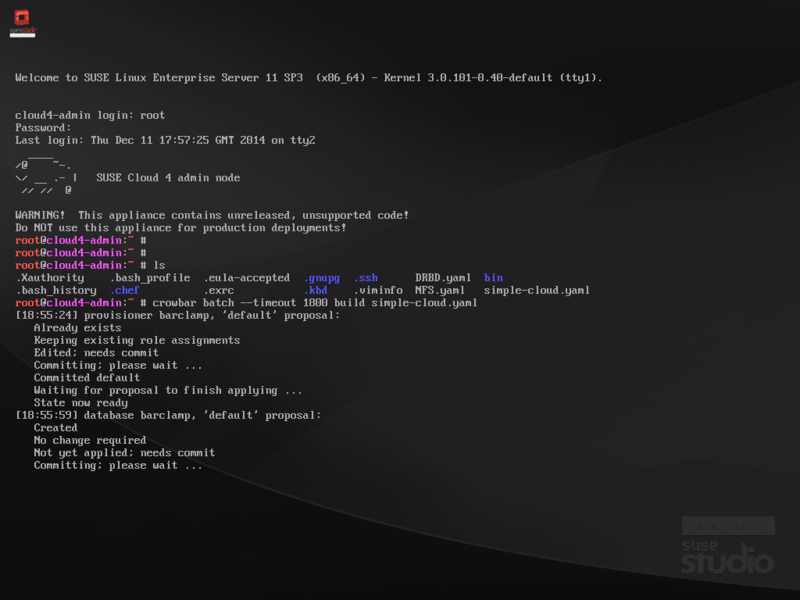 This process is relatively straightforward, and a full explanation can be found in the corresponding chapter of the SUSE Cloud 4 Deployment Guide. Congratulations! 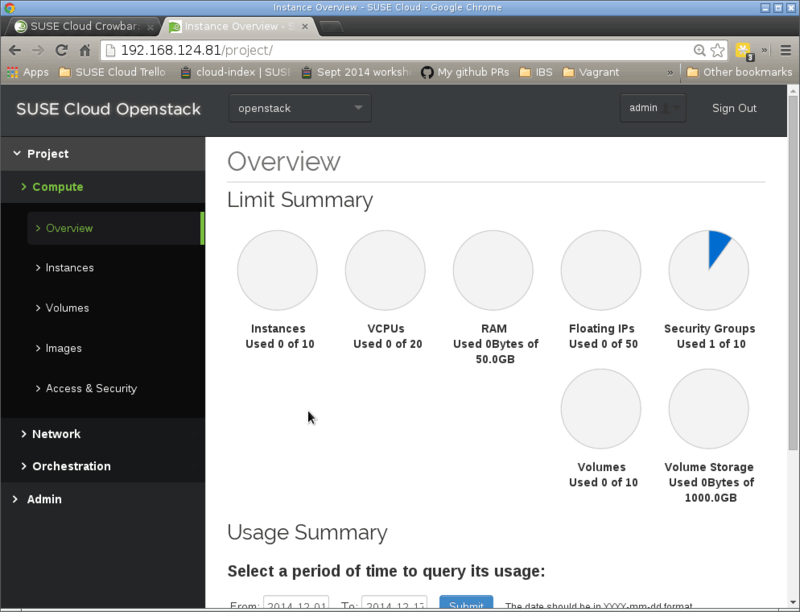 You have set up a full OpenStack cloud from scratch! 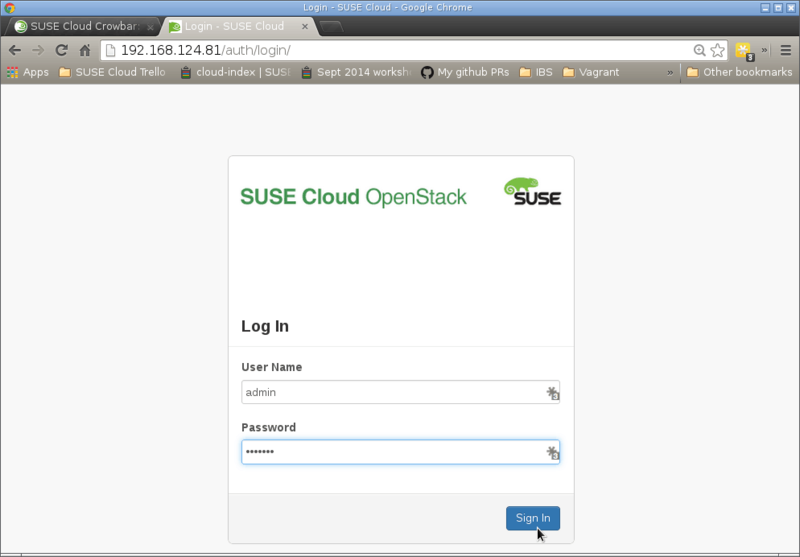 Now you can start reading the SUSE Cloud Admin and End User guides to learn more about how to use OpenStack. As we say in the SUSE world, have a lot of fun!